Interior office spaces lacking light and windows can feel cramped and constricting. Toss in some low ceilings and fluorescent overhead lighting and it's a wonder anything gets done. A great solution to opening up a space without embarking on a major construct project is to use custom wallpaper to create a faux garden atrium. The look that we've created and displayed encapsulates our goals in creating an atrium from merely wallpaper. Just as a real garden atrium, our mural wallpaper atrium features greens that are vibrant and energizing. The mural starts on the side wall, and continues above the seating area on the ceiling, giving that sense of openess you'd feel from an authentic atrium. The exaggerated scale of the palm fronds also brings a little modernity to the wallpaper design. In short, what was a simple space before now thrives with the feeling of life. 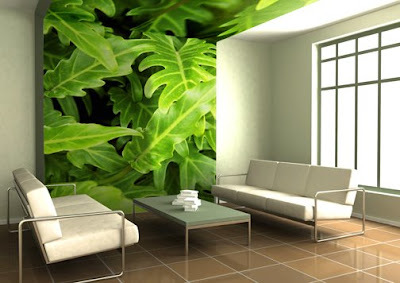 Of course, we could produce an atrium custom wall mural that would be much more literal. The murals would contain plants and flowers at their typical life size. We would also mimic glass and window framing to flesh out the atrium structure. The final illusion the custom wall mural would need is a blue sky above to cap off the look. Either way, literal or abstract, custom wallpaper can truly change your environment. Keep your custom wallpaper atrium super and green and ask about our wallpaper that is produced on material that has LEED points and contains 20% post-consumer waste.